City-born rancher Benjamin Ernst and his herd of teenage help return to the Bar None Ranch for another summer of desert dustups and adventures. Season 3 episodes include a baseball game, ghost stories, Brad attending summer school, a wrestling match and even a possible marriage! Hey Dude ran on Nickelodeon from 1989++1991 and has since become a cult sitcom favorite. So wrangle your boots, bandanas and cowboy hats, because the Bar None Ranch is open for business in Hey Dude Season Two! *Artist: HEY DUDE *Genre: Television: Nickelodeon *Rating: TVY *Release Date: 19-JUN-2012. UnbeatableSale.com offers the most incredible deals on the latest furniture, electronics, gifts, health, and baby items. 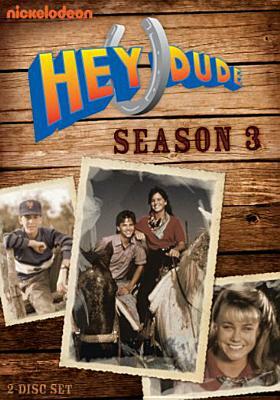 When you purchase this HEY DUDE:SEASON 3 BY HEY DUDE (DVD), you can be confident that you've found the best deal available online. Most shops charge the list price for this item, which is $20.48. At UnbeatableSale.com, you save $0.98 on our everyday price - that's at least 5%! Can't decide? UnbeatableSale.com gift certificates are always just right! At UnbeatableSale.com, we guarantee you won't find any of our unique deals anywhere for less. If you do, we'll match that price before the order is placed.